Ladies Western Wears comprises the dresses which are specifically designed for parties. Manufactured using finest texture fabrics like polyester, wool, silk, velvet, chiffon, georgettee etc, these are available in a wide variety of sizes, colors and styles. 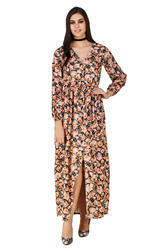 These funky apparels are designed keeping in mind th latest trend as per fashionable industry. We take a huge pleasure in the market offering best quality collection of Western Wear in many sizes and color options. We are the prominent supplier of a wide assortment of Party Wear Western Dress. Our offered western dress is available in a plethora of designs and shades to cater individual demands of our honored clients. We are a unique name in the industry for manufacturing an extensive collection of Women's Western Dress.